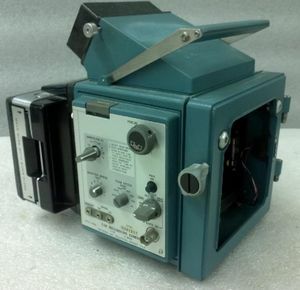 The Tektronix C-50, C-51, C-52 and C-53 are oscilloscope cameras primarily targeted toward the 7000-series scopes but also compatible with other instruments through mounting adapters. The cameras used interchangeable packs for 120 roll film, Polaroid pack film, or 4" × 5" film. The cameras have a three-pin connector matching the 7000 series camera connectors to the left of the CRT. This connector carries 15 V power, ground, and a sweep reset signal from the camera to the scope. In single sweep mode, pressing the shutter button on the camera opens the shutter and signals the sweep reset, arming the timebase's sweep; the scope's GATE output, connected to the camera's GATE input, closes the shutter 5 seconds after the sweep is complete. The cameras also have NC and NO sync contacts (actuated by the shutter) that can be used e.g. to advance a frame counter when connected to a 7M13's sync jack. This page was last edited on 31 March 2019, at 07:01.